The car is among the most expensive investment for many people. And just like them, you want it to serve you well and also for a very long time. You don’t want to keep repairing it, watching it lose its beauty and functionality, or have to worry about unauthorized people touching it. The weather is one of the destructive things that can easily ruin the appearance of your car. The first item on this review is this beautiful-looking car canopy from the well-known Abba Patio. It has a practical dimension of 10 x 20 feet and creates a good shade to suit different vehicles. It is ideal for many places with minimal difficulty and will look right courtesy of the elegant styling. The canopy is made of a robust double polyethylene fabric to stop harsh sun rays, rain, dirt, moisture, flying debris, animal excrement and more. It is water-resistant and will keep snow, ice, and rain at bay. A heavy-duty steel frame supports the fabric and is easy to put together. It has a diameter of 1.5-inch which provides good and solid support to prevent tipping over or unnecessary movement. The frame is powder coated to stop rust or corrosion and also gives the poles their nice appeal and finish. It comes in a plain beige color to complement the surrounding and is also easy to maintain. Next, we have the 12 x 20 ft car canopy also from Abba Patio. And just as the name suggests, it targets car owners but also works well with motorbikes, ATVs, boats, machines as well as a horse shed. The large dimension offers proper shelter to prevent wind, rain, snow, dust, dirt and animal excrements from damaging the car’s/motorcycle, boat’s finish. Setting it up is straightforward thanks to the simple design and step-by-step instructions. You need just a few minutes to set it up and are assured of stability because of the solid construction. It’s made using a tough polyethylene material that resists water, UV, wind and other things. And thanks to the 1.5-inch (diameter) steel frames, the canopy stays firm throughput and won’t tip over due to the wind. The powder-coated finish stops rust and fading while the foot pads provide extra stability. The heavy-duty bungees cord secures the tarp cover to the frame via. Forget carports that are cumbersome to set up or don’t offer full protection to your car, motor vehicle, boat or machinery. With the Quictent carport gazebo, you will have peace-of-mind knowing your car is well protected from the element. 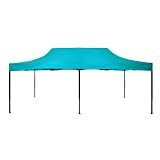 It comes in a practical size of 20 x 10 feet and creates a perfect shade. It is good for many locations including the home, business premises, institution, park and more. The extra-thick Polyethylene fabric together with the reinforced PE material prevents the canopy from tearing easily and also stop rain, snow, ice, water, strong sun rays and other things from penetrating through. It is also UV- resistant and maintains its good looks even after extended exposure to the elements. The car shelter relies on thick stainless steel poles for support and stability. They are powder coated to stop corrosion and rust and are easy to join together and also take apart. Boasting of a heavy duty steel framework, this canopy tent will keep your car well protected from the sun, wind, rain, snow and other things. The car shelter measures 20 x 10 feet and provides lovely shade. It’s made of a 160g polyethylene fabric and spreads quickly on the metal base and connectors. And if you are concerned about wind moving the tent, then you will like the 38mm powder coated steel frame. The high strength joint fitting is also made of steel and fit nicely with the frame. It comes in a classy white color and has 2 removable sidewalls. The portable tent is easy to setup and take down and lightweight for convenient carrying. Why should you hasten the aging on your car or boat when you can offer it full protection? The American phonic canopy tent is solidly built to endure the snow, rain, rain, wind and other elements. It is ideal for both commercial and residential applications and suitable for the office, home, Business Park, parking lot, park and many other locations. 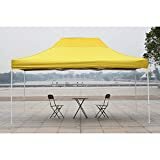 The yellow tent measures 10 x 15 feet and provides a good shelter for not only cars but boats, ATVs, and equipment as well. The cover comprises a heavy-duty oxford cloth that is resistant to wind, water, tear, and wear. It is easy to clean and maintain and can handle the hot sun pretty well. The frame is made of premium steel and will make certain the canopy remains firm always or until you choose to move it. And thanks to the nice yellow color, the shelter looks amazing in most places. Also from the American Phoenix brand is this beautiful canopy tent. 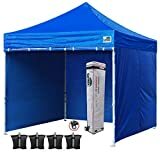 It is fit for sheltering cars, boats and related accessories and doubles as a gazebo tent, wedding tent, and trade show tent. The item measures 10 x 20 feet and is among the larger pieces we have reviewed on this list. It is made from robust and durable oxford material to handle the rain, wind, dirt, dust, and other things. The frame is made of powder-coated steel to stop rust and corrosion and to also enhance its appearance. It is fit for domestic and commercial use and doesn’t need a skilled person to install it. The simple design improves usability and setup whereas the fairly lightweight improves portability. For easy and straightforward setup, the canopy tent comes with simple step-by-step instructions. Abba Patio is a leader in regards to carports and shelters. This is evidenced by the several units they have in this reviews. 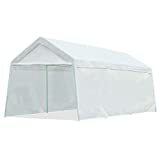 This 10x 20ft white carport is among the top and is perfect for sheltering your car and related activities like a gazebo or trade show. It sets up relatively fast, and in case of difficulty, you need to adhere to the included instructions. The cover comprises a triple-layer polyethylene material that is water and wind resistant. It features heat-sealed seams to keep rain, water and moisture away while the UV treatment protects your car’s paintwork, body, and interior. The heavy duty 1-1/2-inch diameter steel frame keeps the canopy firm while the powder-coating prevents rust, chipping and corrosion. Additionally, it gives the frame its nice look and also improves handling. For extra stability, it comes with non-slip foot pads whereas the heavy-duty bungees cord firmly secures the tarp to the frame. If you wish for a simple car canopy that is easy to set up, then this one from Crown Shades is worth a thought. The patented 10 x 10 ft canopy gives you 100 square-feet of shade to protect the car, ATV, motorcycle, boat and other things. It has a pop-up design which is not only easy to use but also offers instant shade. It is fit for the business premises, home, car park, park and many other places. And like all the featured carports/ shades on this review, it provides maximum protection. Chances of snow, ice, rain, or strong sunrays passing through it are minimal. The unit features a central hub for easy quick setup and has an adjustable strength that reaches a maximum height of 9.19 feet. The water-repellent 150D Oxford canopy is UPF50+ rated and will safeguard the car from harmful sun rays. And courtesy of the 0.5mm steel frames, the accessory remains firm and is long-lasting. With the Eurmax Pop-Up canopy, your car, boat, ATV, machinery and other things will maintain their nice appeal for a more extended period. The outdoor tent is fit for commercial and residential use and is made of heavy-duty fabric for maximum protection. The Royal Blue canopy offers a decent shade of 100 square feet (10 x 10Ft) and is held together using steel truss. The frame is rust/corrosion-resistant thanks to the powder-coating and is easy to assemble and disassemble. It has waterproof seams to keep the stored items dry whereas the thumb latch lock system improves functionality. The sidewalls can be removed, and the big foot pads minimize movement and improve stability. It is UPF50+ rated and provides 99% UV protection and is also CPAI-84 fire retardant certified. 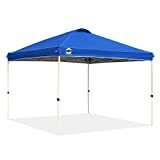 Other than sheltering the car and other equipment, this item also doubles as a tent for picnics, trade shows, parties, and other outdoor events. This grey- colored canopy will provide the perfect environment for your car and other things. It has right shade and requires minimal skills to set it up or take down. In fact, a newbie can assemble the car canopy by merely following the included instructions. The cover is made of a strong 600D oxford fabric. The PU coated fabric can bear the rain sun, dirt, snow, ice and more. This car shelter is very waterproof, and your car and other things will stay dry even in wet situations. It is resistant to wind, dust, and also offers good hail protection and UV protection. The strong steel frame gives it stability especially in windy situations while the simple design improves maintenance. 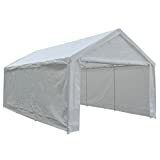 Other than a car canopy, this item is also a good tent for parties, gazebo, picnics, and trade shows. Cars can cost an “arm and leg,” and it’s important to take good care of it. You need to ensure it’s well protected from the elements (sun, wind, rain, snow, ice….). Discourage unauthorized people from touching it, safeguarding it from animal excrement or bird droppings, and also ensuring the interior temperature isn’t too high because of the hot sun. One of the most effective and reliable ways of doing so is using a carport or shelter. 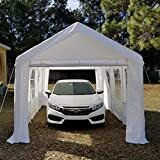 It provides a nice shade that thoroughly covers the car can easily be placed in many places, works with different types of cars, and some can also be used for other things like sheltering people or as a gazebo. In the above breakdown, we have shown you the best car shelters that are worth acquiring. We prioritized on quality, portability, reliability, effectiveness, affordability, unfriendliness and maintenance. You can, therefore, rest easy knowing your car is week protected.